In 1830 the Rev. Samuel Marsden, the founder of Anglican mission in New Zealand, paid his sixth visit to the Bay of Islands. He had already founded Church Missionary Society (C.M.S.) stations on the coast at Rangihoua (1815), Kerikeri (1819), and Paihia (1823), and by 1830 he was determined that his missionaries should establish an inland station in the Waimate area as it was suitable for an agricultural settlement. It was Marsden's intention that the MÄori should adopt agricultural and other aspects of European culture along with the Christian religion, and Waimate seemed an ideal spot for a mission farm where the MÄori could be taught English rural crafts. It was the center of a large MÄori population, which the missionaries had been visiting throughout the 1820's and it was the place where the great Ngapuhi chief Hongi Hika, who had died in 1828, had had his principal cultivations. In 1830 the site for the station was chosen. It was decided that George Clarke, Richard Davis and James Hamlin should be the lay missionaries at the settlement, with the Rev. William Yate as mission priest in charge. Land was purchased at Waimate, the chosen site for the mission; 735 acres in August and a further 300 acres in October. George, James Hamlin, and Richard Davis built the road between Kerikeri and Waimate, and a bridge, with a 64- foot span, across the Waitangi River in 1830. 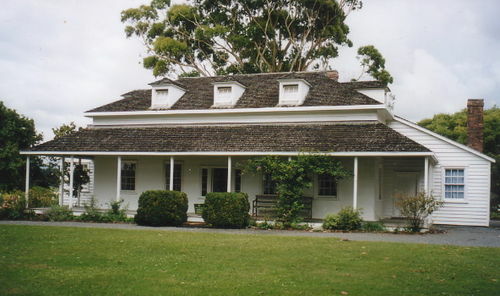 The Waimate Mission House 'The old Vicarage' is the second oldest house still standing in New Zealand, only the Kemp House in Kerikeri is older. It had been designed by George Clarke, and financed by CMS. It was built in 1831 - 32 by 80 MÄori workers under his supervision. With the exception of the window glass, hearthstones, door and window furniture (hinges), all the materials for the house were prepared locally by MÄori workmen. 200 Shingles, 700,00 feet of timber and 80,000 bricks executing fine joinery, the house measures 247 square meters (2658 square feet). After more than 170 years it stands as a reminder of one of the largest and most vigorous of New Zealand's early Christian missionary settlements. This house is one of three, of similar design, built at Waimate for the Church Missionary Society. MÄori carpenters under the supervision of the missionaries George Clarke, James Hamlin, and Richard Davis built the houses. George turned his energies to carpentry carting and architecture. Sheds had to be built first to accommodate the families. Native puriri was felled and in 1831 three substantial sheds erected. Clarke who had learned from his builder father, was the acknowledged expert, & supervised the building of the three houses. June 1832 the families moved in. This is where Edward Blomfield, Hopkins, Thomas Harrington, Jane Roberts, Marsden, Martha Elizabeth, John Betts, Sarah Hopkins were born. This house was the home of the Rev. William Yate from 1832 to 1834 and of the Clarke family (with whom Yate lived) from 1832 to 1841. With Bishop Selwyn's arrival in 1842, Clarke's former house became the Bishop's Palace. Although imported flour was cheaper, it seemed that this remarkable enterprise might pay off and that Marsden's fantasy of New Zealand being self sufficient in flour, and molding promising native clay into off- colour yoeman might by realised. Through the 1830 the mission station flourished. Agricultural implements where made in the blacksmith and wheelwright's shops and by late 1834 New Zealand's first flourmill was operating. Wheat was grown to supply the various mission stations with flour. MÄori people attended the chapel and mission schools in large numbers. Many accepted Christian teaching and some received experience of English farming. Further missionaries joined the station; in particular the Rev William Williams in 1835, when the English boy's School for the sons of missionaries was moved from Paihia to Waimate, and John Bedggood, a wheelwright, who arrived in 1836. In its hey day in the mid 1830's, the mission station was a large thriving village. The English crops, fruit and vegetables, pigs and poultry and mill greatly impressed Charles Darwin when he visited Waimate in 1835. This was New Zealand's first full-scale European-style farm. But the station's heyday was brief. The farm proved uneconomic. Difficulties of land clearance, soil fertility, and weeds meant that it was cheaper to import flour from New South Wales than to grow and grind wheat in New Zealand. In 1838 Henry Williams, hiding behind the kids as usual, advocated closing the station, the farm no longer being tenable as children of the missionary's occupy the land leaving no room for anyone else. Suspicion grew among the MÄori about European acquisition of their lands. These and other factors led the mission into decline by the end of the 1830s. Te Waimate was run down when Bishop Selwyn leased it in 1842 to found St Johns theological College. One of Selwyns improvements was to give the exterior its first coat of paint. In November 1844, Selwyn, his lease from the C.M.S. having fallen through, moved his family and college to Auckland. After Selwyn's departure, the C.M.S. re-established a teaching mission at Waimate and the Rev. Robert Burrows occupied the house. Soon afterwards, the station faced upheaval and devastation. Burrows spent his time carrying messages between the warring parties and attending to the dead and wounded. Buildings and fences were vandalized by Church Missionary-despising infantry, (in winter quarters there after the battle of Ohaewai) between pro and anti Government faction in 1845, but this was an excuse for the stations decline and not the cause. The Church Missionary's had abused MÄori trust and their integrity, and no longer had either. The Mission House escaped serious damage because British soldiers were stationed there over the winter occupation and because of the vigilance of Robert Burrows. Burrows stayed on at Waimate until 1854. Despite his efforts to maintain the mission schools, they did not flourish. The mission gradually declined. All of the buildings other than Clarke's were gone. The other two mission houses were lost, one by fire in 1863, the other dismantled in 1902. Most of the one thousand acres of mission property was sold after 1873, the surviving mission house continued to be occupied by Anglican clergy families as the parish vicarage for the nearby church of St John the Baptist (rebuilt 1871). The Rev. E.B. Clarke returned to his birthplace on the death of the Rev. R Davis in May of 1863, he took over the care of the mission station and district, living in the old Vicarage for nearly 20 years until 1884.Some time in the 1870s, a gabled roof with one prominent central gabled window replaced the original roof of the house. When the Historic Places Trust took over the 'Old Vicarage' in 1960, it was decided to restore it as nearly as possible to it original design and character. The original hipped roof and small dormer windows were rebuild, as was the verandah. Upstairs are three bedrooms; downstairs are three more bedrooms and a study, parlor, dining room, and kitchen, with a large cellar. Among the furniture and effects are many items used in the house in its first fifteen years. These provide links back to the days when it was part of a busy mission village and briefly a bishop's palace. The house was opened to the public in 1966. At the opening it was Edward Blomfield Clarke (son of Henry Tacy Clarke) who turned the key. The house is furnished with missionary period furniture and tools. Nearby, the Bedggood Buildings include the ruins of a cottage and a reconstructed blacksmith's shop, together with archaeological features and historic trees.